In this 2018 paper, El aboudi and Benhilma discuss the data management architectures of healthcare from the perspective of Northern Africa. 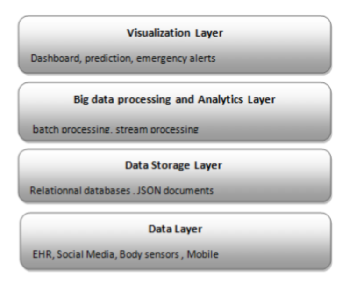 As part of their discussion, the authors propose "an extensible big data architecture based on both stream computing and batch computing in order to enhance further the reliability of healthcare systems by generating real-time alerts and making accurate predictions on patient health condition." With such an architecture, they conclude that, when implemented well, the healthcare system may be "capable of handling the high amount of data generated by different medical sources in real time."